Yes! 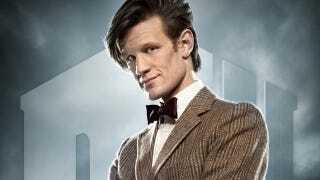 Matt Smith is officially back for another season of Doctor Who. The BBC has just confirmed that Matt Smith's Doctor will be back for (at least) another 14 episodes of Doctor Who, presumably referring to a Christmas special plus thirteen episodes in series seven. There's no word yet on his companions. The news came from Sam Hodges, the Head of Communications for BBC1, who just tweeted "Fourteen new episodes have been commissioned with Matt Smith as The Doctor." This means we can officially stop worrying about another Doctor bidding farewell to the show...or, at the very least, we can table all that until 2012. The news come on the heels of recent indications from Smith himself that he wants to go to Hollywood someday, which some fans - as some fans are wont to do - took as proof that he would soon be leaving the show. 14 eps + Matt DEFINITELY. I've got a plan and I'm NOT TELLING YOU WHAT IT IS. Now hush or River shoots you with her Spoiler Gun. Moffat later made clear that the 14 episodes do indeed refer to a 2011 Christmas special, plus the standard 13-episode season in 2012. Still up in the air is the Doctor's companion situation. None of these early reports mention Karen Gillan or Arthur Darvill, and recent circumstantial evidence suggests the end of the current series will see the departure of Amy and Rory. While it would be silly to read too much into a few very short tweets, the fact that only Matt Smith is confirmed might be taken as another indication that we will see a new companion or two in series seven. So there you have it! Bow ties will officially remain cool for at least another year. Now, if you'll excuse me, there's a merry jig that I really ought to be doing.